It’s Halloween season, so you know why Invasion Of The Body Snatchers is about the scariest movie there is? Or why the Cylons in Battlestar Galactica were so much more effective in the new version as human replicas than as the clunky metal monsters of the ’70s? It’s because the scariest thing in the world is the monster right next to us; it’s even more terrifying when the monster turns out to be someone we thought we knew. And as Gracepoint reiterates every single week, we don’t really know anyone. Danny Solano himself reports from beyond the grave this episode: “Nobody knows me. Nobody has any idea what I really think.” The stories of various Gracepointers we thought we knew unravel enough to keep us hooked for another week as we search for a killer. My biggest problem with Gracepoint right now has to do with Anna Gunn as Ellie. It’s an odd portrayal. When searching for adjectives to describe it, the word “sullen” immediately comes to mind. Also, “whiny.” Even when the writers try to toss Detective Miller a collective bone, there isn’t much that Anna Gunn can do with it. That “eager beaver” exchange in the car? Beyond painful. How can she say “You should see your face right now?” when Carver looks exactly the same as he always does? How can a cop sound whiny when she’s trying to get a perp to put his hands on his head? (“Now! Do it now!”) Even her attempt to get her son excited about chocolate ice cream is muted. I don’t get it: Gunn is obviously talented and has been vibrant in other roles (I particularly enjoyed her recent comic turn on The Mindy Project), but here it’s as if someone turned a light off. Maybe that’s part of the character, maybe it’s part of the plot, but it isn’t doing Gracepoint any favors. Part of the success of Broadchurch (will try to keep these mentions to a minimum, swear) was that Olivia Colman stood in for the sympathetic viewer as the heart of the series (still not sure why the grayer skies and Scottish accent made David Tennant easier to take in that show as well, but they did). Colman and Tennant’s interplay was organic, unforced—they were such different types that their banter was both effortless and entertaining (Remember this exchange? : “Do you pray?” “I pray every night you’ll stop asking me questions.”). Here both characters are sullen, and yes, whiny, which makes our detectives a difficult team to put in the center of Gracepoint’s unfolding drama. Fortunately, other players are stepping up. Virginia Kull has a lot to carry this episode as Beth, as she realizes that no one in her life—not even her lost son—is who she thought they were. Faced with her husband’s deception last week, she turned to her daughter, and this week in a devastating scene, discovers that Chloe has been hiding things from her as well. But also in the lack of chemistry department: If the show really is conjuring up some sort of tension left over from the early romance of Beth and Paul the Priest, the casting is off. Their relationship appears more sibling-like than sexual, even when he’s forlornly looking at their high school graduation picture. Paul’s feeble attempt to protect Beth from Raymond Connelly, slamming him up against a wall from “a place of concern,” is nicely deflected by Raymond’s psychic revelation: “I know how close you used to be.” I’m still not sure what the psychic is standing for (an element of the mystical, perhaps), but he adds some needed mystery to the mix. Some of the mysteries are milder: the link between Vince and the Trailer Park Lady (kind of wish she had a name by this point, so I could quit writing that), or why English innkeeper Gemma is so lonely, or who Carver is calling on his cell phone. But some retain such terrifying menace, and again I point to my favorite Gracepoint character (by far) Tom. Tom raids his cop mother’s notebook for information! Tom traces a phone number to an address better than I could! Tom goes into a barn with scary Vince, who shuts the door in a frightening way! Tom appears to be going after the freaky backpacker on antipsychotics! But according to Gemma, who isn’t on some sort of medication? 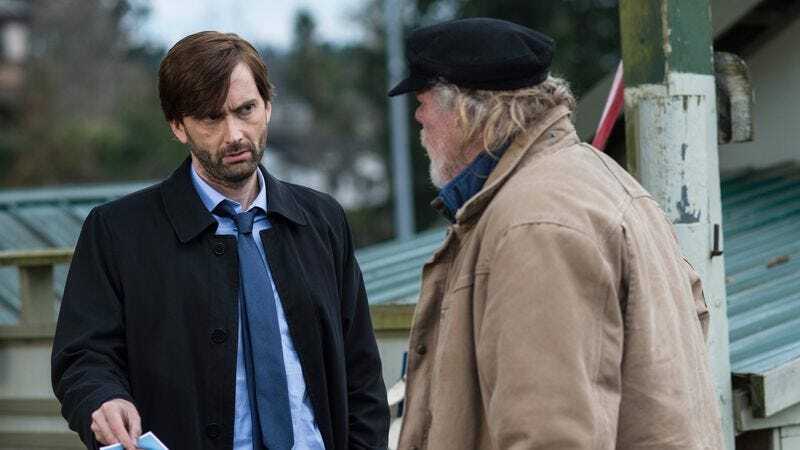 It doesn’t take much to sift through the Gracepoint clues to reach each episode’s prevailing theme, but this week she clearly spells it out for us: “Everyone’s got something going on.” Even our victim, Danny. Maybe that’s why for Beth her formerly domestic life has turned into nothing less than a horror show, with lying stand-ins for the people she thought she knew, Body Snatcher-style. In her last scene she practically begs Mark to tell her the truth, and he doesn’t. When he says “I’m sorry,” she replies, “For what?”: It could be any number of a vast multitude of things. The Solanos definitely have their problems: Their first conversation this episode about the memorial sounds like a dinner party they had neglected to plan. But the living-room explosion and the scene that almost ends the episode shows just how lost they are from each other. The short flashback scene showing a happier Beth with the backpacker—even the glowing wedding photo from last week—indicate how far this family has fallen. If you can’t trust the people in your own family—specifically, your children, who Beth points out that she has devoted her entire adult life to raising—who can you trust at all? The production quality of the series remains at its highest level. James Strong also directed several episodes of um, that other series, so the camera-as-watcher viewpoint remains intact. I love the long shots of the town and its inhabitants, as if we might be viewing Detective Pete marching up to the Solanos’ front door from across the street. Or how something as lovely as a child’s soccer game transforms into a reminder of something sinister. And I’m glad we weren’t robbed of the powerful closing shot of the burning boat: A disturbing and compelling emblem of what Gracepoint might have in store for us next week. Why would Dean automatically run from the cops? Fortunately this led to my favorite new character, drug dealer Mickey Felton, who appears to be the only person in Gracepoint who actually knows what’s going on. Showing the grieving family a video of their son shoplifting (on the flat-screen TV in their own living room!) was extremely harsh: On this we agree, Ellie Miller.